My last post was about how not everything of mine is homemade. Today, my post is about some quick homemade rolls. I find it kind of ironic, don't you? Anywho... I do use Rhode's Bake and Serve rolls for some occasions, but I usually prefer to make my own rolls. Why? Simply put... they are cheaper. I always have the ingredients on hand, and it saves me money. Cha-ching! 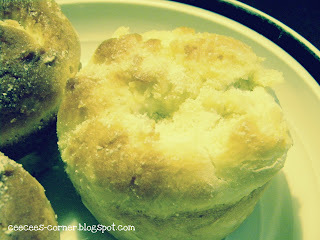 I have been on the prowl for a simple and easy homemade roll recipe for quite a while. During my "roll hunting adventure", I have tried many different roll recipes, and have finally found one that I love because it's quick and painless. Before I tell you why I love this recipe, just know that I hate kneading dough/ Ugh, it's a lot of effort. This recipe is super easy and there isn't any kneading involved. I can handle that! Plus, it's not a recipe that I have to start early in the morning in order for it to be done by dinner time. I usually start this while my girls are napping, and it's done by dinner! Yay!!! I love to make these rolls! I love to butter them fresh out of the oven and sprinkle some Parmesan cheese on top. **In a large bowl, mix the shortening, sugar, and hot water. the yeast does need a warm environment in which to grow. 110 degrees Fahrenhet. Just an FYI... I've killed many dough recipes with water that was too hot. **Mix in the yeast and let it dissolve. You will know that the yeast is active if the water mixture starts to bubble and froth. **Mix in the egg, salt, and flour. If the dough is too sticky, add a little flour. **Let the dough rise until doubled in size. If you are strapped for time, set your oven on warm, cover the bowl with a towel, and let it sit in the oven. I've done this and it speeds up the process because of the heat. But don't get the oven too hot! **Once the dough has doubled in size, preheat your oven to 425 degrees Fahrenheit. **Roll the dough into 8 little balls. **Drop the dough balls into the muffin cups and allow it to rise again. **Bake for 10 minutes. I think I usually check on the rolls at about 8 minutes, just to see how they are coming. Don't be scared by making homemade rolls. Trust me, I've had more than my fair share of screw ups, but this recipe has been pretty much fail proof for me! I love to cook & bake, but find that I NEVER bake bread (other than quick breads), rolls, basically anything that calls for yeast or rising. Not that I can't - I just don't usually want to take the time. I think I can handle this one! :) I'll have to try it next week - thanks for the great ideas! These rolls sounds fabulous! I love that they don't have to be kneaded. I definitely am going to give them a try! !